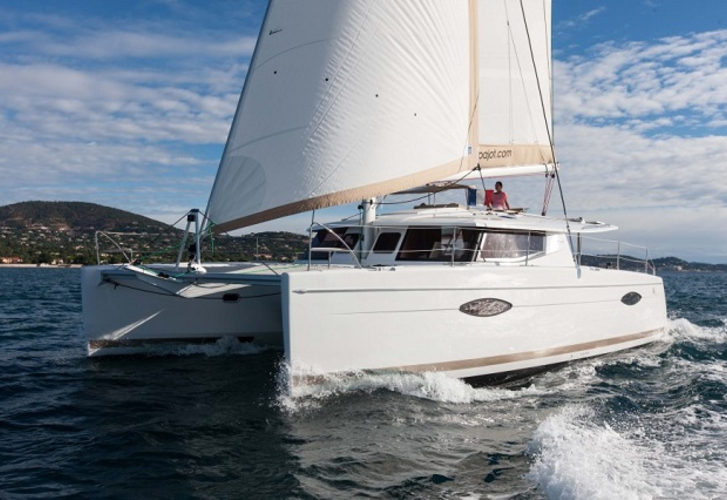 Dora is a name of sailboat Helia 44 ,which was produced in 2013. You can charter her from marina Bar in the region close to Bar. Dora is furnished with 8 beds. Beds on the yacht are arranged in 8 (8+1) layout. 4 cabins are situated inside the sailing boat Dora. Use our search engine to find more boats here: Catamarans Bar. Crew members can feel comfortable on this sailing boat , because there are 4 heads for their disposal. With 470.00 l liters in tank for fuel you can sail really far and still be independent because of 750.00 l liters in water container. Dora is powered by engine 2x40 hp Volvo diesel. Yacht's dimensions are: LOA - 13.26 m , width - 7.40 m and 1.15 m of draft. On the boat there is following equipment: Autopilot, Gps plotter, Radar, 2 refrigerators, Heating, CD/MP3 player, outside speakers, Bed linen, Electric hallyard winch, Mainsail with lazy jack, Electric fresh water pump, Wc pump electrical, Microwave, Anchor electric windlass, Bimini top, Dinghy, Inverter 12v-220v, Solar panels. . Nonrefundable deposit there is 3000.00 EUR. In our search engine you can quickly check avalailability of sailing boat Dora from Bar here: Catamarans Montenegro.